U.S. stock futures pointed to a positive start to the trading week, with the major indices edging higher, as investors turned their focus to the latest batch of corporate earnings. About a quarter of companies report in what will be the on Wall Street, with results from Apple (NASDAQ:) and Facebook (NASDAQ:) highlighting the schedule. At 5:45AM ET, the blue-chip were up 50 points, or about 0.2%, the added 8 points, or around 0.3%, while the tech-heavy indicated a gain of 55 points, or roughly 0.8%. 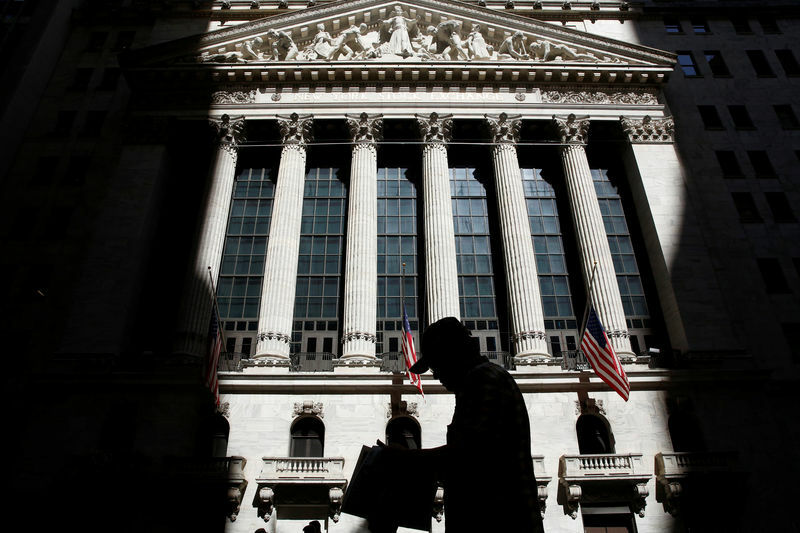 Stocks fell sharply on Friday as investors slogged through another volatile session on Wall Street, which saw the S&P 500 end at its lowest level since early May, flirting with correction territory. Elsewhere, in Europe, the region’s major bourses were , with HSBC (LON:) shares pacing the financial sector, even as political risks in Germany, Italy and the UK continue to weigh on sentiment. Earlier, Asian stock markets gave up most of their morning gains to , as major fell more than 2% each by the end of the session. IBM is acquiring Red Hat, a major distributor of open-source software and technology, in a deal , as it seeks to diversify its technology hardware and consulting business into higher-margin products and services. The acquisition is by far IBM’s largest deal ever, and the third-biggest in the history of U.S. tech. IBM (NYSE:) shares were down 5.6% in pre-market trade, while Red Hat (NYSE:) saw shares surge 52%. Away from equities, the dollar was against a basket of the other major currencies, holding close to Friday’s 10-week highs. The , which measures the greenback’s strength against a basket of six major currencies, edged up 0.2% to 96.33, not far from the 10-week peak of 96.62 set on Friday. Elsewhere in currencies, the was a touch lower, as German Chancellor Angela Merkel faced calls from her own conservatives , further eroding her authority after painful losses in a regional election. The was also slightly lower against the greenback, as investors awaited the from British Chancellor Philip Hammond. In commodities, oil prices to start the week, as a slump in stock markets and concerns about slowing global growth clouded the fuel demand outlook. U.S. futures were at $67.06 a barrel, down 54 cents, or 0.8%, from their last settlement. Front-month futures were trading down 63 cents, or 0.8%, at $77.03 a barrel. Losses were kept in check as looming U.S. sanctions on Iran, the third-largest producer in the Organization of the Petroleum Exporting Countries (OPEC), are widely expected to lead to a tighter market. On the economic calendar, investors will get more data on the state of the U.S. consumer with personal income and spending data for September set for release at 8:30AM ET. Economists expect personal income to rise over the prior month, while spending is forecast to gain , according to estimates. The Fed’s preferred inflation metric, core personal consumption expenditures (PCE), is also set for release in the morning. The consensus forecast is that the report will show that the core PCE price index inched up last month. On an annualized basis, core PCE prices are expected to rise . The highlight of this week’s data releases will come Friday, when the U.S. Labor Department releases the nonfarm payrolls report for October.